Note: Several spellings exist for Coega. These include Ngqura, the Xhosa spelling which is used in the port of Ngqura Establishment Act and is the official spelling used by the National Ports Authority; Ngqurha, as has been used on occasion by the Department of Public Enterprises; and Coega which is that used by the Coega Development Corporation, the Industrial Development Zone and most other people. Other spellings include Cougha, Coecha, Koecha and Koega. The name is of Khoekhoen origin for the river of the same name and means ‘ground water.’ Coega is pronounced ‘koo-gha’, with a guttural sound forming the last syllable. To pronounce Ngqura correctly requires an ability to sound the click as used in Koekhoe and Xhosa. 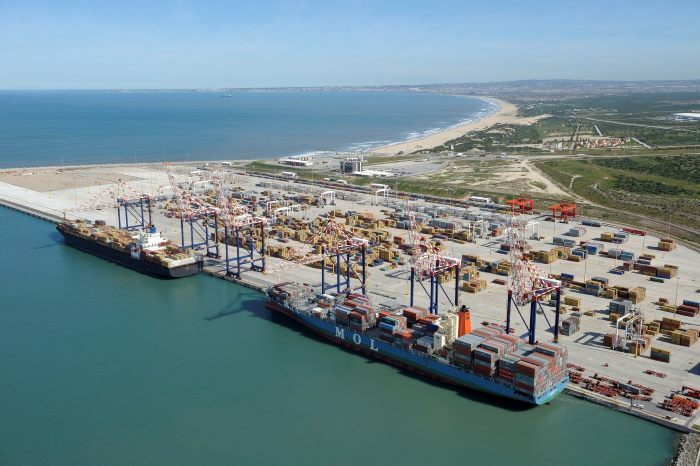 The port of Ngqura, which began commercial ship operations (containers) in October 2009, lies some 20km northeast of Port Elizabeth and is South Africa’s 8th and latest commercial port development, situated at the mouth of the Coega River in Nelson Mandela Bay (Algoa Bay). Transnet National Ports Authority of SA is responsible for developing the deepwater port, while Transnet Port Terminals (TPT) has been appointed to handle all terminal operations.An Industrial Development Zone, known as the Coega IDZ, has been developed over the 12,000 hectare site in the area including the river and port, with a 4,500 ha core development immediately identified. The IDZ serves as a primary location for new industrial development for export driven industries. The horizontal geometry of the port is such that 150,00DWT bulkers and 12,500TEU cellular container ships can manoeuvre within the port, although initial dredging is being limited to accommodate the design vessels only. Seven berths totalling 2,100m of quay wall – four for containers, two for dry bulk and breakbulk cargo and one for liquid bulk cargo have been provided. The berths have 150 tonne bollards and fenders at 20m centres along the berths with a proprietary fender system at the container terminal and double tyre fenders at the bulk berths. TNPA has installed a Cavotec automated mooring system initially on the two additional container berths taken into service in 2015. The system will complement manual berthing teams at the port by stabilising container ships on the quayside and reducing docking and undocking times. 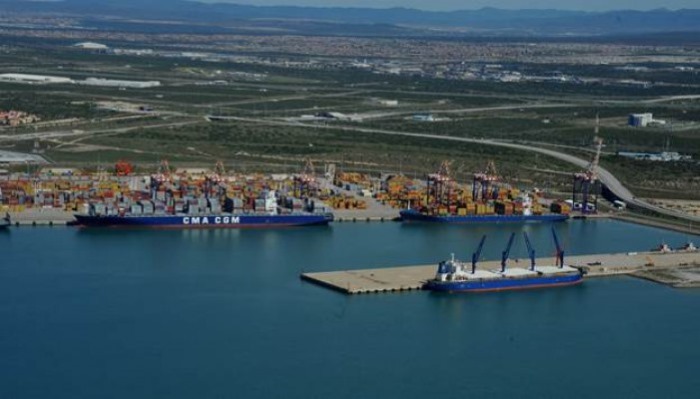 A total of 32 berths have been identified in the ultimate, fully developed port with the intention of developing the port further up the Coega River valley and southwest along the coast. This will be a long-term project however. A sand bypass system consisting of jet pumps to divert sand affected by the littoral drift was designed to transfer sand/water slurry from the updrift to the downdrift side of the port (west to east), although this has proved problematic owing to the large amount of rocks and rubble blocking the system. As a result of these problems a similar sand bypass system planned for the Port of Durban was later abandoned, with the method of using dredgers remaining in place. Funding of the entire port infrastructure (approximately R10-billion, first stage) was provided by Transnet, of which the National Ports Authority (landlord) is a subsidiary division. Funding of the adjacent Industrial Development Zone has been provided by central and provincial government, with detail funding coming from private investors. Some R1.8 billion was to be spent by Eskom to increase the provision of electricity to the region for the development of an aluminium smelter, although by 2009 the aluminium smelter project had fallen through. This had national implications in view of Eskom’s undertakings. Since then however the IDZ has attracted several alternative investors including a Chinese motor manufacturer. A rail link exists between the Ngqura port and the existing Port Elizabeth – Gauteng main railway line. The existing mainline railway, as well as the N-2 road highway, pass through the Coega Industrial Development Zone. In 2009 the first of two 70 tonne bollard pull Voith tugs, SHASA was delivered from the shipyard in Durban, followed by the second tug named ORCA which was delivered in 2010, followed by the third tug for the port named LIZIBUKO (2010). 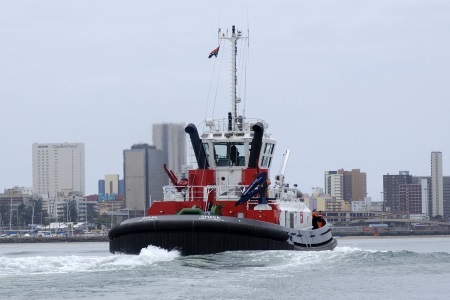 An additional two tugs MVEZO and QUNU have subsequently been constructed and delivered to Port Elizabeth/Ngqura. The impact of a new IDZ and port at Coega/Ngqura on the Eastern Cape of South Africa has proved of great benefit to an otherwise largely impoverished and undeveloped region where large-scale unemployment is a major factor. However its effect on the nearby port of Port Elizabeth only 20 km away remains unclear and Port Elizabeth harbour is having to re-focus on certain cargo types only, such as the auto industry, fresh produce, fishing and tourism industries along with a reduced rate of containers. In its initial stages the concept of a new port at Coega was floated, at least publicly, as a deep-water bulk port to handle manganese and other bulk ore exports that could be re-directed away from Port Elizabeth and the city. However that changed following an initiative to develop a container terminal at Ngqura. Much of the emphasis on the new port therefore switched to clean cargo with a strong focus on containerised cargo, although manganese ore exports are to be transferred from Port Elizabeth from some time after 2017. Political and economic imperatives of building the port will continue to outweigh all other considerations. Intentions to develop an aluminium smelter at Ngqura/Coega came close to being realized but were finally dashed following the discovery that Eskom was having difficulty in meeting the country’s energy requirements. With the change of emphasis for Ngqura towards container handling it then appeared that the future of this port lay in becoming a transhipment hub for the sub-Saharan Africa and Western Indian Ocean regions. The impending transfer of the manganese terminal as well as recently anounced plans (December 2016) for the Grindrod Group to develop an oil services site at Ngqura will however serve as reminders that this new port is still in the developmental stage and will evolve the way the market largely dictates. In the 2016 calendar year the Port of Ngqura handled a total volume of 7.788 million tonnes of cargo, almost entirely containers, and down considerably on the 9,649 million tonnes recorded in 2015. The port’s container terminal handled 572,021 TEUs (636,663 in 2015) during the year. Total ship calls in 2016 were 498 (2015: 542) representing a gross tonnage of 31,158,924 -gt (2015: 33,376,068 gross tons).